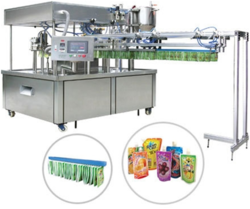 We are a leading Manufacturer of automatic juice pouch filling machine and automatic self spout pouch filling & capping machine from Ambala, India. 3. All contact parts with the product to be filled/packed are made SS 304. 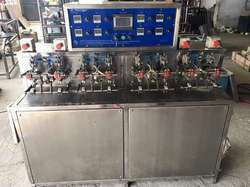 APPLICATIONS: This machine is used to fill and cap spout type stand-up pouch with sauce, juice, alcohol, oil, water, detergent, cosmetics and other liquid or paste alike. Machine Weight : 2300kg Approx.